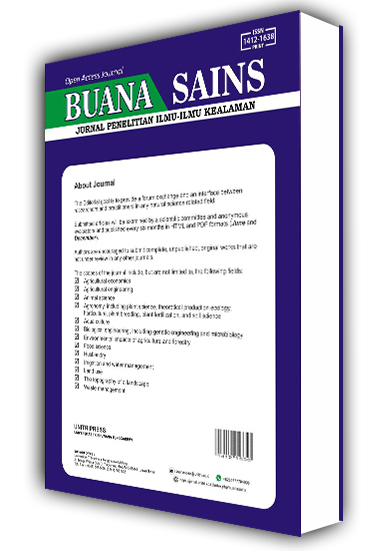 BUANA SAINS p-ISSN : 1412-1638 | e-ISSN: 2527-5720 is a double-blind peer-reviewed, open-access journal, published by UNITRI PRESS. It publishes original and applied research in all areas of natural science. The Editorial goal is to provide a forum exchange and an interface between researchers and practitioners in any natural science related field. The journal is published in both print and online versions, and the online version is available for free.The Author Guidelines can be viewed it here, and the manuscript template can be downloaded on the right side bar.For author interested in submitting the manuscript, kindly ­register yourself.